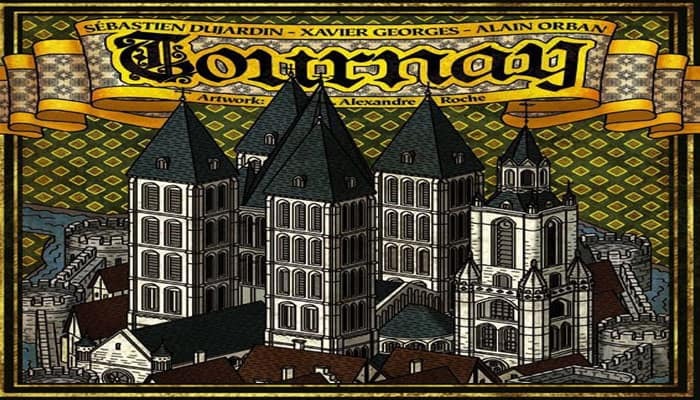 Tournay is a card game in which you play a wealthy Tournaisian family directing a district of the city and managing its citizens, which are of three classes: the military (associated with red), religious (white), and civilian (yellow). The game's activity cards are separated by level (from I to III) and color (red, white, and yellow) to form 9 distinct decks. Players initially have 2 citizens of each class that they will use to perform different actions: draw a card, activate a building in their district, combat an event, earn money, or gather their citizens on their Plaza in order to make them available again. Cards you draw may be placed in your district (a 9-space grid) at the beginning of a turn. Level I and II cards provide you with various benefits, while level III (prestige buildings) will score for all players at the end of the game - not just for the player who built them. The player with the most prestige after the final scoring will win the game! Place the gameboard with its "Supply" side face-up. Place 3 citizens of each color on the board, on the designated spots. Sort the activity cards by color and level so as to have 9 decks of 10 cards each. For an introductory game, use only the basic cards. Shuffle each of these 9 decks and place them in descending level order below the appropriately colored slot of the gameboard. Form a deck with 15 Event cards and place it above the board, above the first black slot. Reveal the top 3 cards from the event deck and form the event queue by placing them above the other three black slots. Each player takes 6 deniers, a Plaza card, and the scoring token of the same color, and sets them in front of himself. Each player stands 2 citizens of each class (yellow, red, and white) on his Plaza card. Throughout the game, the citizens standing on his Plaza card are the available citizens. Place the remaining deniers and the damage / gray citizen tokens in a general supply. Designate a starting player who takes the start player marker for the whole game. The start player marker is only used to determine exactly when the game ends. 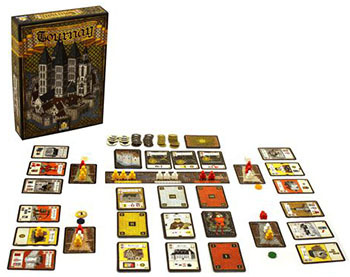 Buildings: Players construct them in their districts, where they can activate them with citizens of the same color, in order to benefit from the buildings' effects. 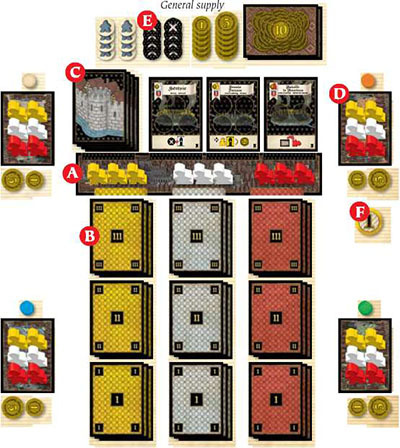 Characters: Players place these in their districts, and they interact with the cards situated in the same row or column, l > as indicated by the four arrows around the edge of the card. You never place a citizen on a character card to activate it. Prestige buildings: These are the Level III cards, which can provide prestige points at the end of the game. Each prestige building built causes a scoring for all players at the end of the game. Town Criers: There is one of these in each of the 9 decks. These cards announce events. When such a card is drawn, the events in the queue are activated! 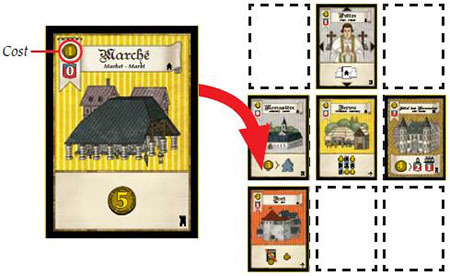 Each player can place Building, Character, or Prestige Building cards in order to construct his district. This district will have a maximum size of 3 rows by 3 columns, which is 9 spaces total. perform an action with the citizens (mandatory). You may play one card from your hand in order to build it in your district. 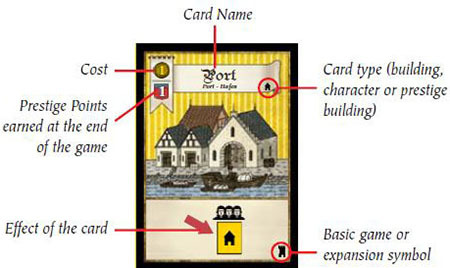 You must pay the construction cost that is depicted in the upper-left corner of the card in order to play it. The card must be orthogonally adjacent to a card already played, with the obvious exception of the first card you play into your district. Each player's district can neither extend more than 3 rows nor more than 3 columns. It is possible to play a card on top of another card of the same color (two or more same- color cards can be stacked). On the other hand, if you want to play a card in a space occupied by cards of a different color, the old ones are discarded face-down under their respective decks before being replaced by the new one. It is possible to place a card on a card occupied by a token. If it is a damage marker or a gray citizen, return it to the supply. If it is your citizen, lay it near your Plaza. You can not build two prestige buildings (Level III) with the same name; however, you can place two Level I or Level II cards with the same name. Example: Madeline Hit begins her turn with her district already comprising 5 cards. She wants to place a market card from her hand. Placing this card costs her a denier. She can put it on one of 4 empty spaces in the grid that forms her district, or lay it atop one of the two yellow cards already played, or replace the red card or one of the two white cards with it. You must use one or more available citizens of the same color to perform an action. the available citizens on your opponents' Plaza cards. You must pay 2 deniers per citizen to the citizen's owner. After using it, lay the citizen down beside its Plaza card: it still belongs to the same player, but it is unavailable for the time being. It is possible to use citizens from several players for one action. Activate one building in your district. Gather your citizens on your Plaza card. With a single citizen, you can draw a Level I card of the same color as the citizen. Two citizens of the same color permit you to draw a Level II card of the citizens' color. Three citizens of the same color permit you to draw a Level III card of the citizens' color. The citizens used to draw cards are simply laid down, beside the Plaza card from which they came. or take the first two face-down cards from the deck, look at them, then choose one and put the other face-up on top of the deck. It is possible to choose this second option when a card is already face- up on top of the deck: First place the face-up card face-down under the deck. If there are only 2 cards in the deck (regardless of whether one is visible), draw them both, keep one, and put the other back face-up. If there is only one card, you must take it. In the event queue, its effect is triggered when a player draws a Town Crier card. This effect can be positive or negative. You can combat an event in the queue. In this case, the card goes into your hand and becomes a rampart. It is possible to construct the rampart when a Town Crier appears, in order to protect yourself from the effect of one event card. Drawing A Town Crier Card And Triggering The Events. All players are affected by all the cards in the Event queue (these effects are described on the player aid). Each effect is applied once for each coin on the card (regardless of whether a coin could be added to the card in the previous step). Each player can construct a rampart by playing one Rampart card from his hand in order to avoid the effects of one entire Event card L...of his choice (regardless of the number of coins on it). If you do this, place the rampart card face-down near your district. It will bring you 1PP at the end of the game. It is possible to construct several ramparts in order to defend against several event cards triggered by the same town crier. For convenience, all the Rampart cards played by a player are simply kept in a single pile. token from the supply on the activated card. The different icons used to indicate the effects of the different buildings are explained on each player's player aid. Only unoccupied buildings can be activated. A building is unoccupied if there is neither a citizen nor a damage / gray citizen token on it. You never place citizens on the character cards. These cards merely improve other actions in your district. You can work diplomatically against one of the events in the queue that has at least 1 denier on it. In order to combat an Event card that makes you lose deniers, you must use 2 citizens of the color designated in the upper-left corner of the card. In order to combat the other types of Event cards, you must use one citizen 1= SaJor designated in the upper-left corner of the card, and pay a ra 1som equal to the number of coins present on the card, plus 1 denier. In both cases, the lay the used citizens beside the Plaza card(s) from which they originated (which may be yours or someone else's). Return the coins on the card to the supply, and take the Event card into your hand (It can be built 1er as a Rampart). Replace the old event with a new one from the deck. Example: Justine wants to combat the 3rd card in the event queue. She uses a yellow citizen from her Plaza and pays 2 deniers (1 denier plus 1, because there is one coin on the card), then she adds the card to her hand in order to protect herself from a future event. Important : It is impossible to combat an event that has no coins on it. You can use one or more of your own citizens of the same color to earn 2 deniers per citizen. The citizens used must come from your own Plaza card. Lay these citizens down beside your Plaza card after this action. Example : Aude wants to earn some money. She uses a red citizen to earn 2 deniers. She could have used both red citizens to earn 4 deniers. This allows you to move all your citizens, including those that were played on your building cards, onto your Plaza card. Place them standing upright. Return any damage tokens and gray citizens in your district to the supply. You can even execute this action if you still have citizens on your Plaza card. Important : You can never have more than 4 cards in your hand at the end your turn. If your hand has more than 4 cards after your action, you must discard the extras face-down under the appropriate decks. The Rampart cards count toward this hand limit of 4 cards. You can build one or more ramparts at the end of your turn in order to reduce your hand to 4 cards; but a Rampart card built this way will not be protecting you from an event. Condition 1 : a player has constructed a district of 9 spaces with at least 2 prestige buildings visible. Condition 2 : one Town Crier card more than the number of players has been revealed and placed under the decks (5 town criers with 4 players; 4 with 3 players; 3 with 2 players). Condition 1 and Condition 2 are met simultaneously. Each player can take one final turn. Then, all players can play one last card from their hand into their district. The players simultaneously and secretly choose one card and place it face-down in their district. Then the players reveal their card at the same time, paying its cost, and gaining any benefit from extant character cards in the same row or column that are triggered by that one card. The players can place all their Rampart cards from their hand into their pile of built ramparts. Now the final scoring commences: Flip over the gameboard to reveal the score track, and set the players' discs next to the board. Each visible prestige building earns Prestige Points (PPs) for all players. For each element in his possession that is scored, the player who built the building earns the left PPs , while other players earn the right PPs . Score the cards one by one, starting with the start player, placing a damage marker on each building as it's scored, in order to keep track of what has been scored already. Next, each player earns the PPs indicated just below the costs on all the cards in his district (cards that have been covered also count for this), and 1 PP per card in his constructed ramparts pile. Prestige buildings with the same name only trigger a single scoring: Anyone who built the building earns the PPs on the left; the other players, the PPs on the right.